Extreme weather events are occurring more and more frequently, in line with scientists’ prognostications about the increasingly-dire effects of global warming. Yet polls show that most Americans still do not take global warming seriously. What accounts for such a disconnect? In part, it’s due to how the mass media “stage” their news coverage. Recent wildfires have wreaked absolute havoc in California, covering more than 242,000 acres, destroying more than 13,000 structures including an entire town of 26,000, and killing 85 people with others still unaccounted for. Driven by unprecedented drought conditions, this is the worst wildfire season in recorded state history and it’s far from over. Less than two months ago, Hurricane Michael roared through the Florida panhandle and into Georgia, killing at least 60 and causing $15 billion in damage. 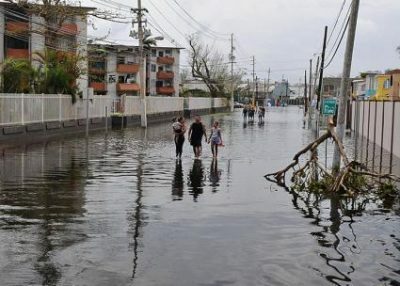 It was described as “the worst hurricane to ever hit that part of Florida.” Last year there was Hurricane Maria that devastated Puerto Rico, with a death toll of almost 3,000 and $91 billion in damage. If climate science is taken seriously, none of these events should have come as any great surprise. Indeed, climatologists have been warning about such calamities for decades, saying that global warming is an existential threat to all mankind. Virtually every national academy of science in the world has joined them. Yet a large percentage of Americans continue to believe that global warming either (a) does not exist or (b) if it does exist, is not caused by human activity and therefore is not something we can do anything about. A recent (Oct 29-Nov 1, 2018) ABC News/Washington Post poll of 1,029 registered voters nationwide, for example, found that global warming ranked only seventh in importance among respondents’ concerns, well below topics such as immigration, “reducing divisions,” and border security. Only 48% agreed it was even a “very important” issue! If indeed global warming is the existential threat that scientists claim it to be, what explains such relative unconcern about it by the US public? Why the disconnect? Although there are of course many possible reasons, certainly one of them is the shortage of attention given to global climate change by the mainstream media. In particular, many natural disasters such as the wildfires and hurricanes cited above are covered extensively by the national news media but with little or no mention of global warming. Thus, many viewers no doubt fail to connect the dots. Far more often there’s no mention of global warming at all. For example, the CBS Nightly News devoted the first 13 minutes of its national broadcast (10.11.18) to Hurricane Michael, yet failed to mention global warming/climate change even once. With regard to the recent California wildfires, a study by Media Matters found that, on average, three main national networks (CBS, ABC, NBC) mentioned “climate change” in only 3.7% of their broadcasts about those fires. To describe these sorts of textual manipulations, discourse analysts use a concept borrowed from the theater world: “staging.” Staging refers to the degree of prominence given to a certain concept in a text or body of texts. Concepts that receive significant attention are said to be foregrounded, those that do not are backgrounded. Backgrounding reaches an extreme when relevant information is entirely omitted. The cases cited above all illustrate such staging at work. In national mainstream news reports about natural disasters, global warming is systematically backgrounded, most often not even mentioned at all. Headline stories capture the attention of countless citizens and could have educational value. When they conceal the linkage between global warming and natural disasters, golden opportunities are lost. Why do they do this? Follow the money! Why do the mainstream news media do this? Although a number of possible reasons come to mind, the cui bono principle leads us to two in particular. First, the United States today is extremely polarized politically, with one entire party notably in denial about anthropogenic climate change. Thus, if a national network devoted much attention to it, it would risk alienating a very large bloc of voters, thereby cutting heavily into corporate profits. Another reason, I would suggest, is the corporate ownership and commercial sponsorship of these same national networks. ABC, CBS, and NBC (and CNN, FoxNews, etc.) are all heavily dependent on a consumerist economic system that does not protect but rather exploits our natural environment. It’s a system that stands to gain, at least in the short term, by suppressing public awareness of global climate change and its increasingly destructive consequences. Systematically downplaying or ignoring altogether the linkage between global warming and natural disasters serves that purpose. This article first appeared in The Daily Doublespeak (dailydoublespeak.com). Tom Huckin is a professor emeritus of English and Writing at the University of Utah, specializing in the study of modern propaganda. He has co-authored five books on academic subjects and written some 90 scholarly papers, including a chapter in Propaganda and Rhetoric in Democracy (2016). He is a co-founder of the Salt Lake City chapter of Move to Amend, which aspires to get big money out of our elections. He can be reached at [email protected].